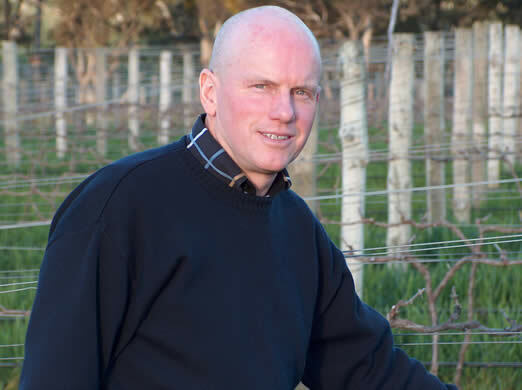 Jeffrey Grosset (pictured above in his Polish Hill vineyard) has achieved fame as the producer of Australia’s most celebrated Rieslings. I was anxious to meet him on my visit to the Clare, but unfortunately this coincided with the first weekend opening of his cellar door, plus a visit by family. Most producers would have used these as quite legitimate excuses to tell me I’m out of luck. Let’s face it, he’s someone who has no trouble selling his wine, and I’m a low-ranking journo who isn’t going to contribute much to his bottom line. His loyalty quite clearly, and appropriately, lies with his customers, but Jeffrey pulled out all the stops to avoid leaving me feeling unwelcome. In the end, the only way I could meet up with him was to show up at the cellar door with the regular punters, which I was glad to do. I arrived mid afternoon after a scoot round the vineyards of Clare, and taste the wines, asking questions but backing off to give him space when his customers arrive. Towards the end of the tasting, all becomes quiet. 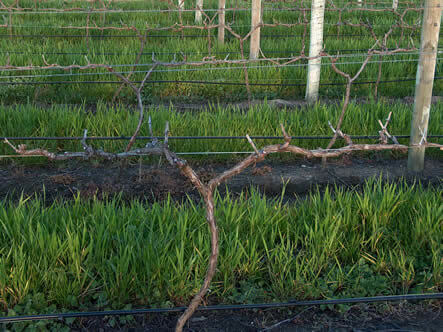 That’s it for the day, so a couple of phone calls later Jeffrey is free to show me round his vineyards. A stroke of luck. The discussion we have is wide ranging; he’s a very thoughtful sort of guy, with well reasoned and quite strongly held opinions. A familiar Grosset theme is that of ownership. Who owns a name? Jeffrey is keen that names of places shouldn’t be locked in and owned by people. Yet he’s understandably a little miffed that a name he has made famous with one of his wines, Polish Hill (from a vineyard in Polish Hill River Valley in Clare), is now being used by others as a marketing tool. I guess it works both ways. 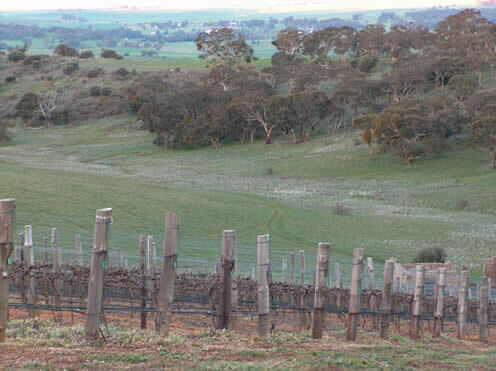 The spectacular Gaia vineyard, stuck out on its own in the rolling high country of Clare, pictured in the evening twighlight. It's a five acre, east-facing site, red soil over red rock that Grosset describes as a soft slate. The land belongs to a friend of Grosset who owns 6500 acres, all above 500 metres high. We also spend some time discussing the Australian Closure Fund which Grosset has just established. It's designed to encourage research into the science of sealing wine bottles. In particular, is oxygen transmission through the closure needed for successful ageing of reds? And the wines? The two Rieslings are fantastic, although a little tight at this early stage in their lives. Jeffrey crushes after destemming and sells off the pressings, because these have a higher phenolic content. Whole bunch pressing has it advocates, but a problem is that it’s then hard to get a clean break between the free-run and press juice. I’m also a big fan of the Gaia, which is a serious red wine of great appeal.